One of the more damaging and misleading bits of political rhetoric in the last few decades -- and there are a number of candidates -- has been the phrase "tickle-down", as applied in a narrow sense to cuts in marginal tax rates and in a broader sense to any policy that refrains from taking money from the relatively wealthy. I had thought the phrase was dreamed up by Reagan's budget director, David Stockman, but apparently he just recycled it -- Wikipedia, anyway, says it may have started with Will Rogers, which is a more appropriate origin. In any case, ever since Stockman it's been widely used by the liberal-left to condemn any move to, say, lower tax rates in an across the board manner, as well as to justify further confiscatory taxation since the state is better able to "spread the wealth around", in Obama's felicitous phrase, than just letting it trickle down from the rich. Of course, Keynes was right, that in the long run we're all dead. But for most of us, that's not all that counts -- some think of the children. So here's a bit of counter-intuitive advice you could give to a young idealist starting out in life, and looking for the best way to benefit humanity as a whole: forget the Peace Corps or NGOs, and aspire instead to become a "robber baron", a la Rockefeller or Carnegie or Gates. You probably won't get that far, but in the process you stand a good chance of actually creating some real wealth, most of which will splash throughout our globalized economy to the benefit of everyone in varying degrees, including, especially, the poorest of the poor; and a portion of which -- but only a "miniscule fraction" -- you get to keep yourself. Charity-nomics may at times result in some good--that is, when Bill and Melinda or Buffett are in a good mood, and assuming the charity-crats actually dispense the funds fairly--yet it's hardly a viable economic model applied across the board. And let's not forget that philanthropy typically involves tax-write offs and other perqs for the ostentatiously wealthy--Carnegie wasn't just creating schools and foundations out of the goodness of his heart (nor are the Gateszillas). Some on the left dismiss charity efforts altogether--Zizek somewhere says like all 3rd world nations should refuse charity and work on like putting Gates & Co in gulags. That's a bit much, but I suspect many poor folks whether in US or across the world (and those attempting to assist them) don't really want handouts (tho'...some welfare addicts may); they want real careers and entitlement in a sense, whether that's just manual labor, or full time teaching or technical work for those with the right qualifications (but say axed because of Ahhnuldnomics). Charity-nomics depends on the largesse of the capitalist-royal, really--who generally were in the right place at the right time, not necessarily Einsteins. Most IT barons were college dropouts...Stevie Jobs for one probably could not read Keynes's General Theory, much less pass an algebra test. At times, yes, it may do some good, like some of the hip celebrities or rockstars handing out twenties to some street peeps in LA --but it's in essence just a temporary fix-it, like winning a big hand at the poker table. In a few months, or days it's forgotten, and the problems of laissez faire remain. J: Charity-nomics may at times result in some good ... yet it's hardly a viable economic model applied across the board. Yes, my point exactly. As I said, "the real wealth dispersed by rich capitalists is that which overflows from their efforts at making money rather than giving it away". By the time they're into philanthropy, of course, the capitalists are mostly old and tired, and giving away their money may be the best they can do. But when most of them were acquiring that money, it would have been sinful for them to give away capital that they could use to generate wealth at such prodigious rates -- wealth, the vast majority of which flowed to others. I'm not so sure on that. Once some wunderkind hits it big, he typical hires some high-powered finance team and then invests in stocks, futures, or just reliable bonds and so forth-- the top tycoons ala Forbes list rake in millions per year on interest and capital gains alone, sans income. I doubt many of them do anything very risky with venture capital-- the philanthropy's probably a money maker as well. Their finance advisors and brokers crunch numbers, sort of like bookies do, and then give 'em odds. Really, deep pocket speculators make oodles of cash regardless of the market--change the longs to short, etc.--at least until a riot or revolution arrives. Tracking a tycoon's investments and spending habits would be an interesting topic for research...yet I doubt one could get access to all the financial records, stock reports, so forth. 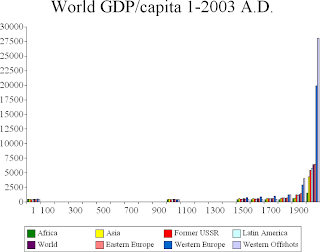 And so how do you explain the explosive, in historical terms, growth in the graph? Where does the wealth suddenly come from? Keynes I'm not but GDP's just one indicator among many, right. It most likely relates to a far more efficient production--Carnegie and Henry Ford-style manufacturing replacing horse and buggy days-- and the growth of technology as much as it does to actual wealth (and capitalism itself does not really blossom until 1600-1700s). It's not an actual standard of living index (--actually looks sort of like..."western society is best" index). Life for the average citizens of Europe and US may have improved, become safer, healthier, richer etc. over the last few centuries, but I'm not convinced life apres-Henry Ford (and all the rest of modern mechanized existence) represents some great advance over the older pastoral existence, regardless of what indicators ...indicate. Ben Franklin--or Thoreau-- probably led a more pleasant existence than many of us do now, even lacking penicillin (or TV , autos, freeways, computers so forth). Walden ponds with DNS and/or WiFi for the masses!--or at least the enlightened masses. J: GDP's just one indicator among many, right. It most likely relates to a far more efficient production--Carnegie and Henry Ford-style manufacturing replacing horse and buggy days-- and the growth of technology as much as it does to actual wealth (and capitalism itself does not really blossom until 1600-1700s). It's not an actual standard of living index (--actually looks sort of like..."western society is best" index). Okayy, J, you hippie you. Yes, GDP's just one indicator among many, but as such it's not a bad proxy for a lot of other good things. Yes, it's about "far more efficient production" -- that's exactly the point. Yes, it's about the "growth of technology", which is exactly how the far more efficient production came about -- and yes, that in turn is about "actual wealth", unless you think such wealth consists of gold and jewels. 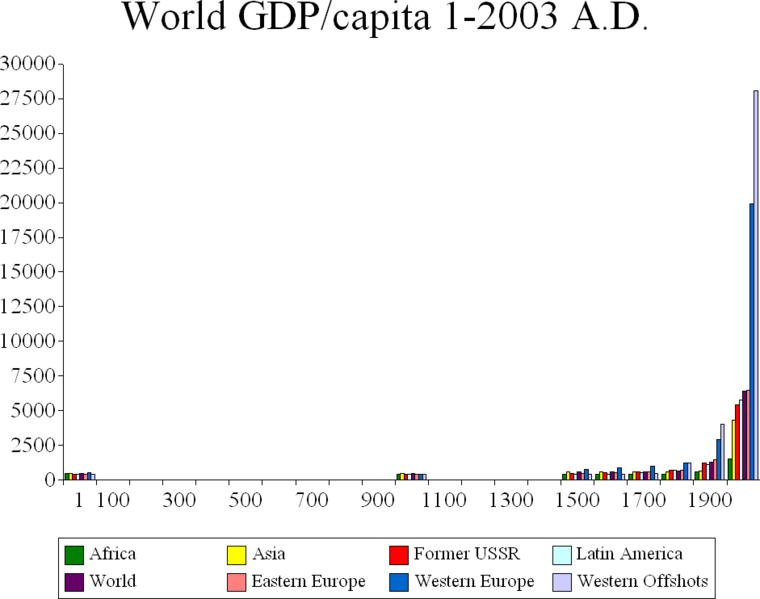 Yes, "capitalism itself does not really blossom until 1600-1700s" -- that's just what I meant when I pointed out that the graph showed a flat line until about 1700, after which it goes exponential. Yes, it's sort of like "'western society is best'" index, which is why western society has spread and morphed into global society, aka the modern, industrialized world. And it's not just GDP. Try graphing life expectancy, literacy, infant mortality, food consumption per capita, or any other measurable statistic. Since 1700, look at the virtual eradication of slavery worldwide, an institution that had previously characterized every single human society but the simplest. Look at the spread of democracy, so that even where it's not yet a reality it's a practical ideal and aspiration. Or, simpler, just have a look at the video in this post. (Self-ref alert -- I'm largely repeating material that I've discussed more extensively in the theme here. (Tho' I remain somewhat skeptical of econo. indicators as a rule). No, I'm no Toynbee, and wouldn't be able even to play a historian. I just wanted to put out, as I indicated, a counter-narrative to the one that sees collectivism as "progressive" rather than an atavistic reaction to the emergence and development of the modern individual. Spengler I'll admit I know little of, but from that little my sense is that his pessimism was at least in part a response to the violence of that collectivist reaction in the early years of the last century. Since that time, a lot of bad has happened no doubt, but generally democracies have strengthened, the West or Western values have spread rather than declined, and environmental/Malthusian predictions of doom have been shown repeatedly to be wildly wrong (see that Matt Ridley video mentioned above). As for the origins of so-called Western values, I can only say that on this level it's a non-issue for me. It's not who came up with the ideas of the modern individual, including equality of status, the rule of law, human rights, etc. -- it's just their inherent value that matters. Sorry, missed the retraction. But I'll leave my response. Scuzi for mix up-- I will say however that while democracy, human rights, rule of law, Due Process so forth, remain important that doesn't mean approving of McDonalds or Walmarts or Googleization. Does accepting democracy mean accepting Walmart? In many places it seems so--even in US. Spengler was a pessimist of course, yet....he did accurately describe the world of the 19th and most of 20th century in a sense: massive industrialism, nationalism, warfare on a global scale (at least starting with WWI), economic and environmental problems (perhaps not as severe as a McKibben thought but peak oil still definitely a concern). Many Americans after WWII grew richer, moved into the 'burbs--Spenglerville--watched prime time, bought cars, and so forth while...the US and USSR played the cold war-chess match, and then 'Nam goes down. At the very least the advances of US democracy have always required great sacrifices, as the coffee-table historian might say. DO YOU HAVE YOUR Ka-Bar Tactical Spork yet?… - DO YOU HAVE YOUR Ka-Bar Tactical Spork yet?